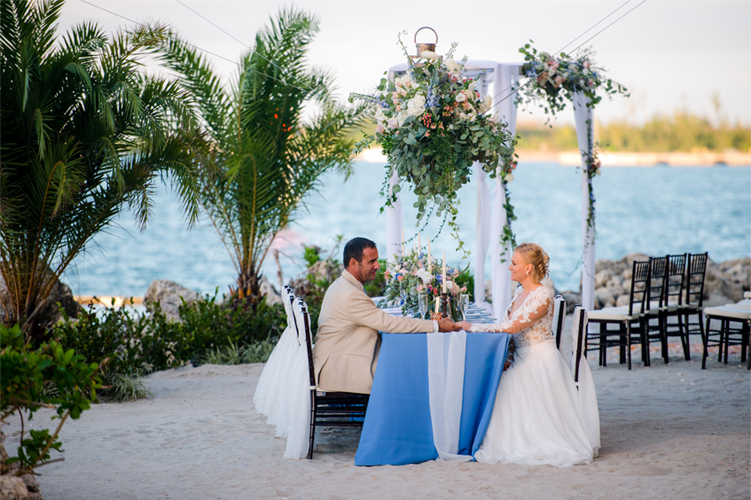 Creating your wedding vision and choosing the perfect design elements to bring your design concept to life is such a fun, creative aspect of wedding planning. 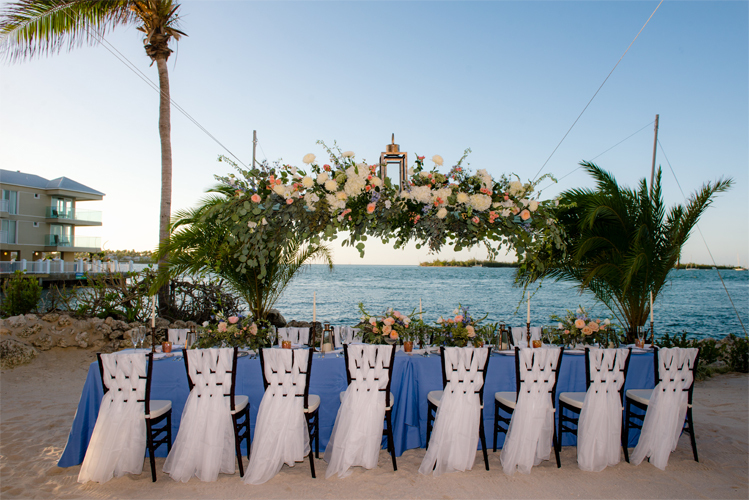 This stunning wedding design concept from our latest South Florida issue of Enchanted Brides features vintage beachside romance for the South Florida bride who loves dreamy, elegant details for a classic wedding ambiance by the water. 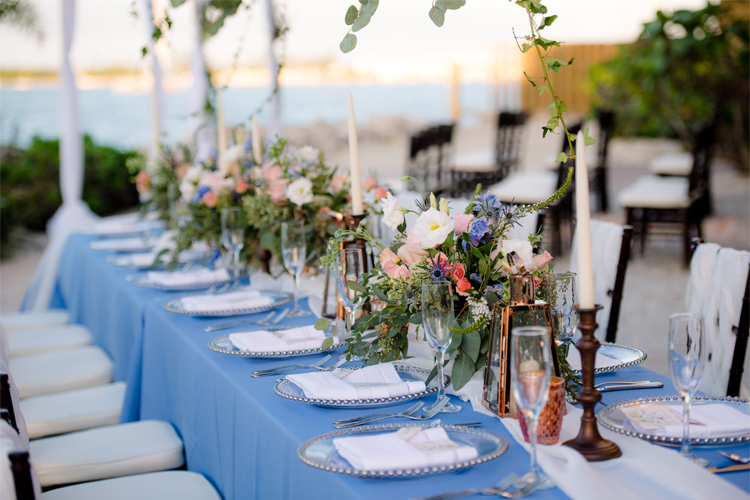 The collaboration of a beachside terrace with vintage, elegant, and romantic decor accents is a fresh and welcoming feature for this Key West wedding celebration. 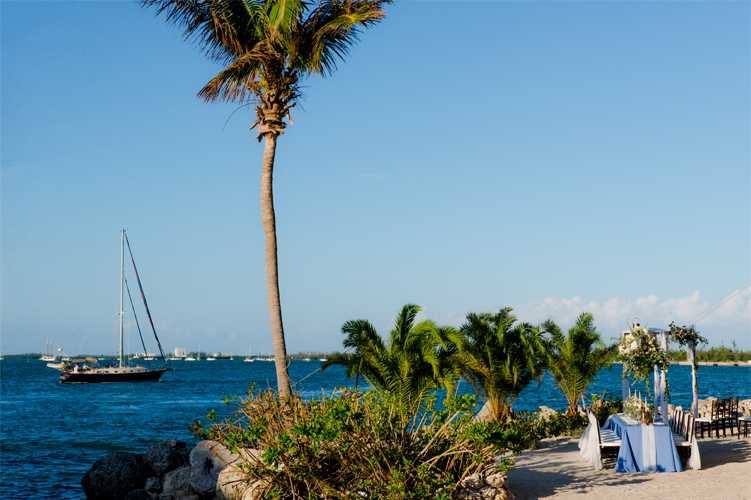 The Pier House Resort & Spa provides the perfect terrace with a beachside area and stunning ocean view. The backdrop of this design concept is a beachside setting. 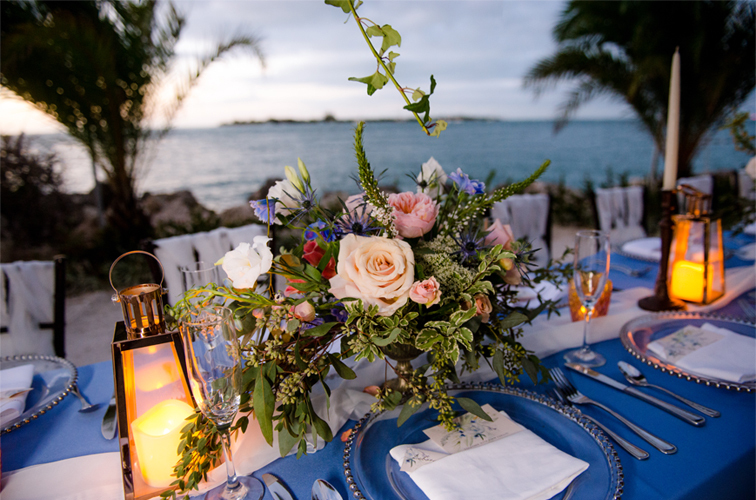 The styling is vintage with romantic elements to complete the overall look of the design. 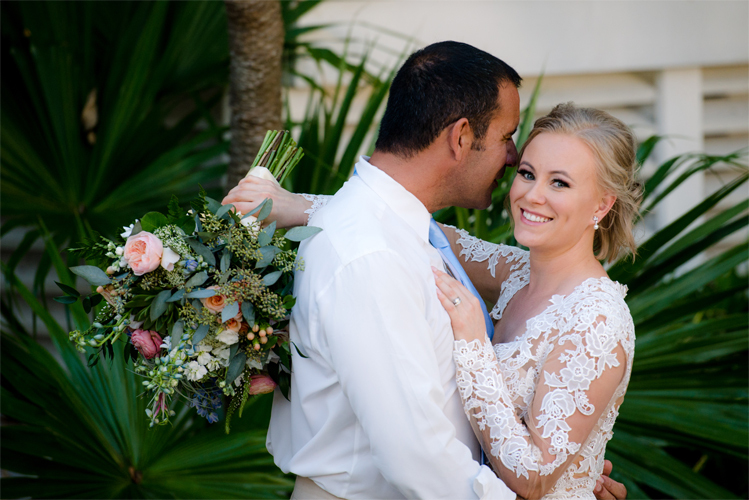 Vintage flowers are so romantic and beautiful for a wedding and continue to be a popular style choice. 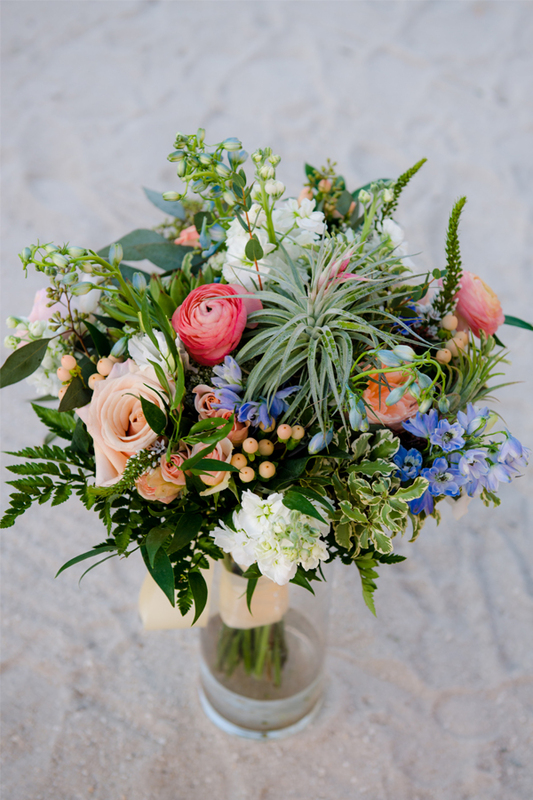 The flowers used for this vintage design concept include Juliet Garden Roses, blue Delphinium, Queen Anne’s Lace, peach and white Ranunculus, Lisianthus, Veronica, and lots of Eucalyptus greenery. 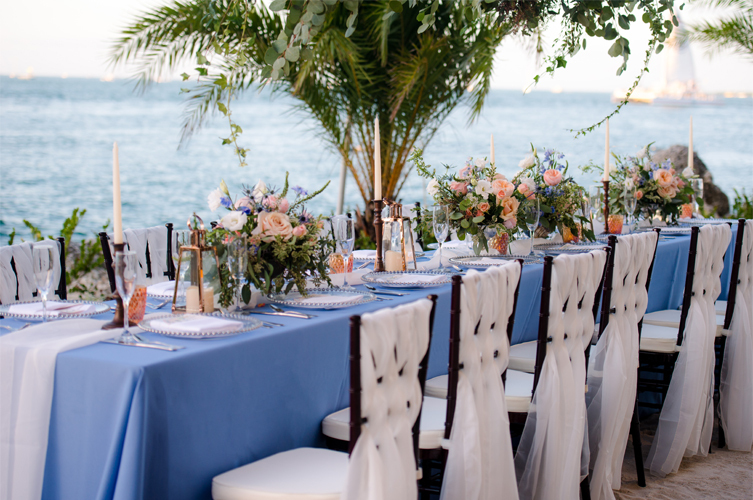 The blue, peach, white, and rose gold wedding palette is unique and gorgeous. 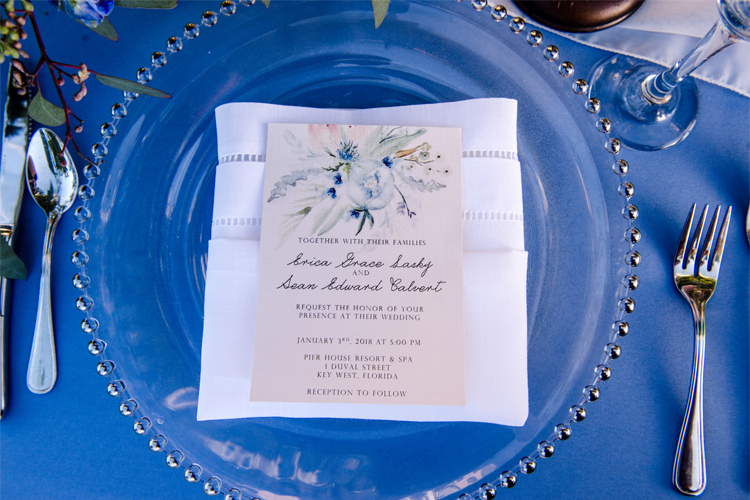 The choice of periwinkle blue makes all the difference in the world in this wedding color palette. The rose gold offers a metallic and shimmery touch to the decor. 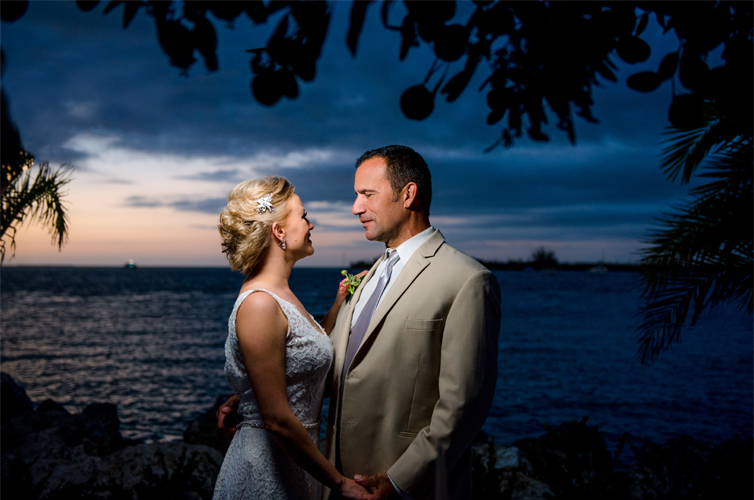 Rose gold is soft and feminine, which brings an element of glamor to the wedding day. 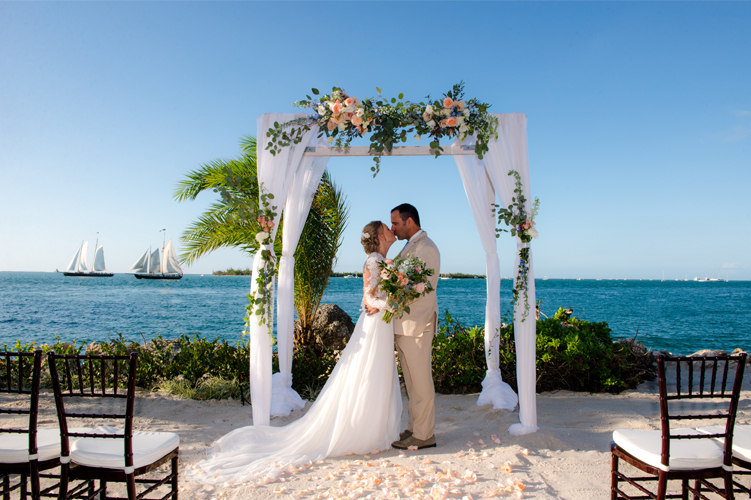 The elegant wedding arch is accented with white tulle and vintage flowers. 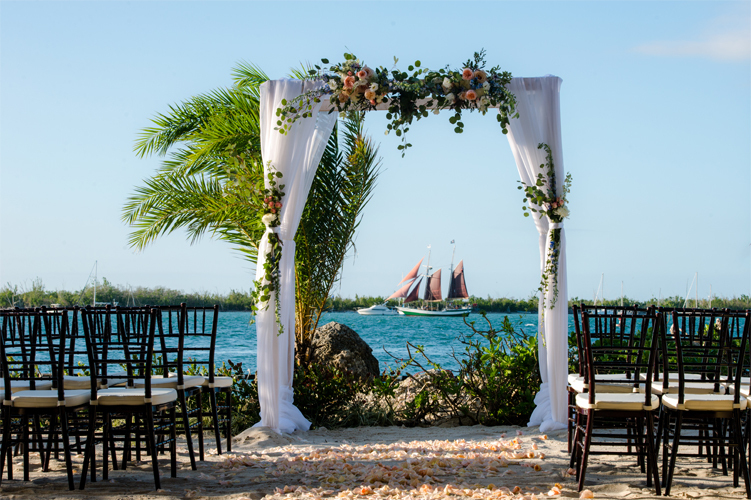 Mahogany Chiavari chairs are very classy and contribute to the atmosphere of the décor. The table concept is playful. 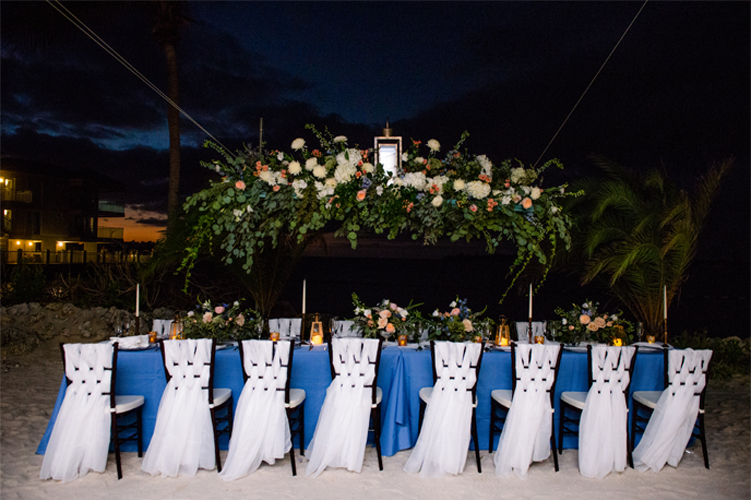 Some delicate details included are chair sashes, vintage topper candles, rose gold lanterns, plate chargers, periwinkle blue table linen, and white chiffon table runners. 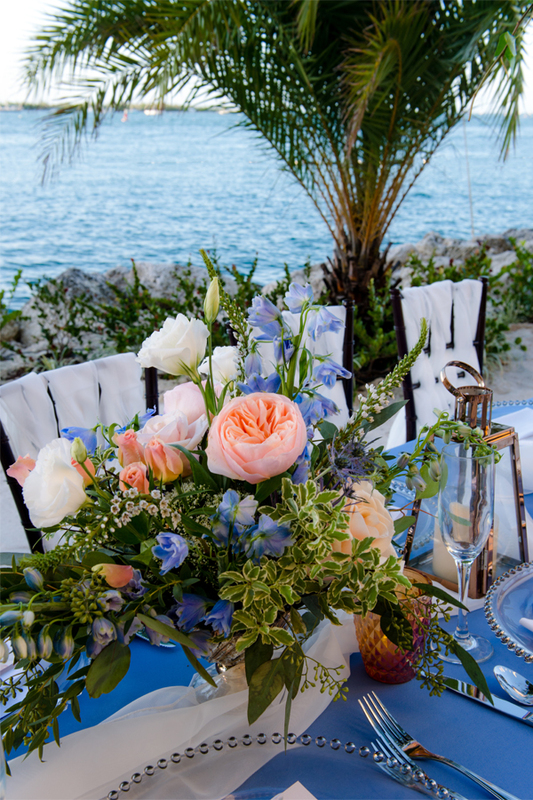 This stunning table with hanging flower piece is decorated with peach, blue, and white accent flowers. 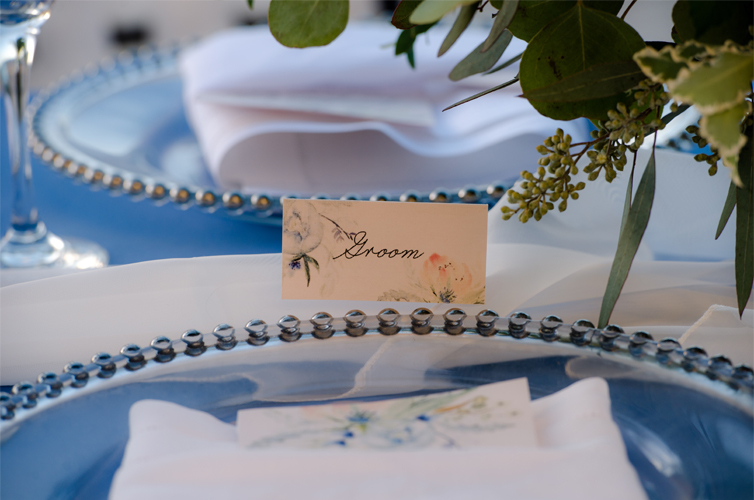 Table cards and menus with ivory background, peach and blue ascent flowers contribute to the romantic reception table concept. 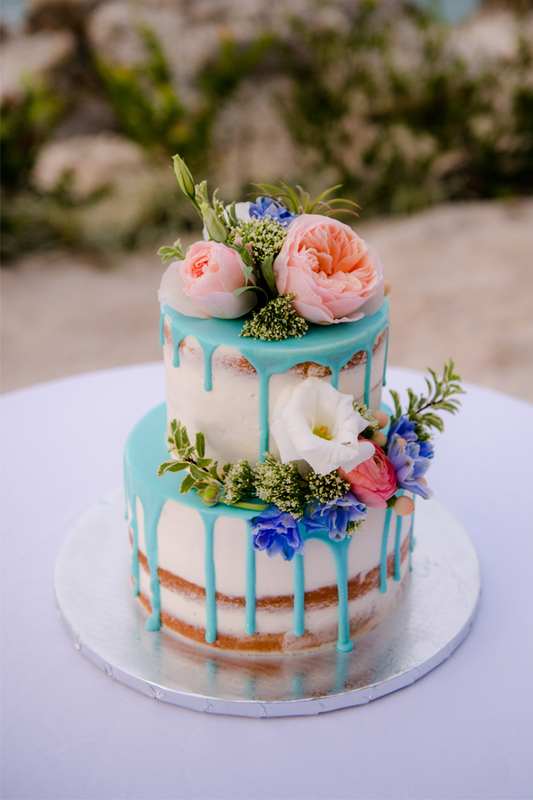 This two-tier naked cake is accented with dripping blue icing and delicate fresh flowers. 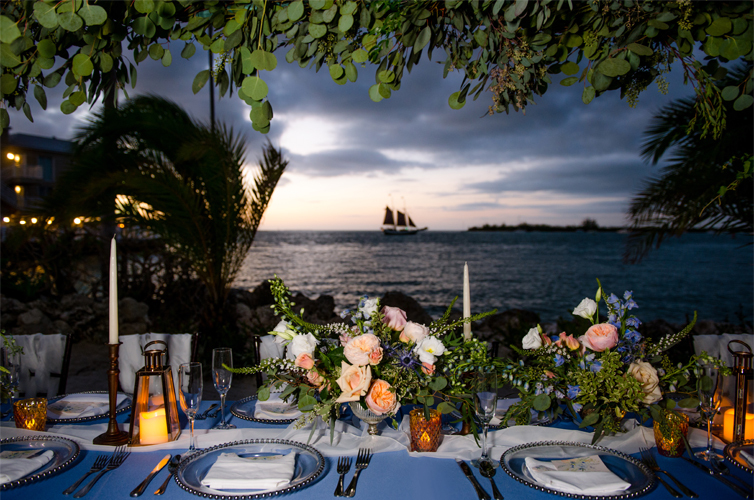 This vintage, romantic design concept created by Say Yes in Key West and Karro Events and Floral is fresh, imaginative, and simply stunning. 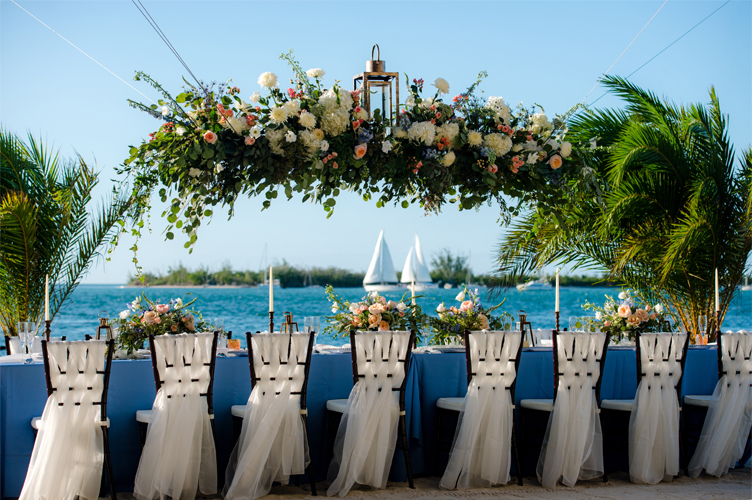 We hope to inspire you lovely brides-to-be in your wedding planning journey through this gorgeous wedding design from our latest South Florida issue of Enchanted Brides!